I have a PhD in being an overtly frugal dude. It’s what made this entire venture of mine happen – i never knew what to buy and only a handful of people were reviewing things adequately. I wanted weights, measurements, pictures, discussion. 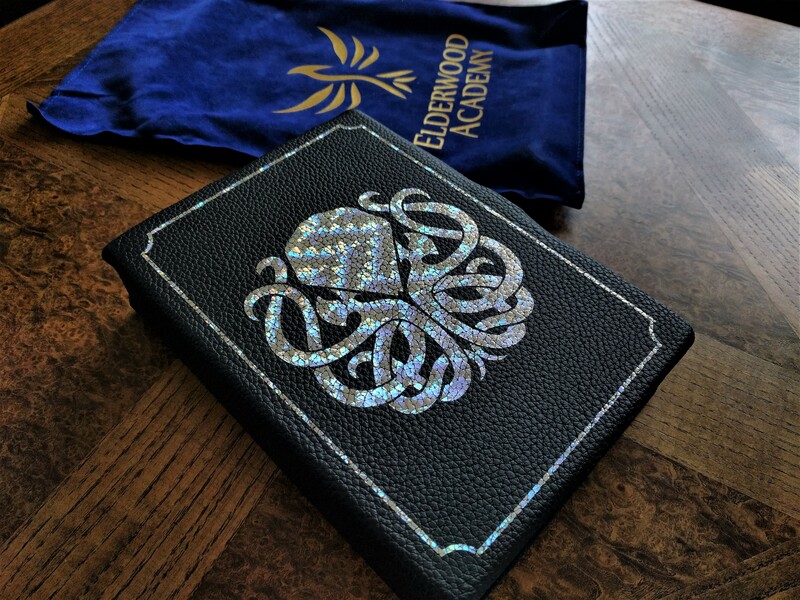 One of the companies that always impressed the hell out of me with the up-front information they’d give customers – almost as though they weren’t trying to trick someone – was Elderwood Academy, and one of their most explosively popular items has to be the Spellbook! 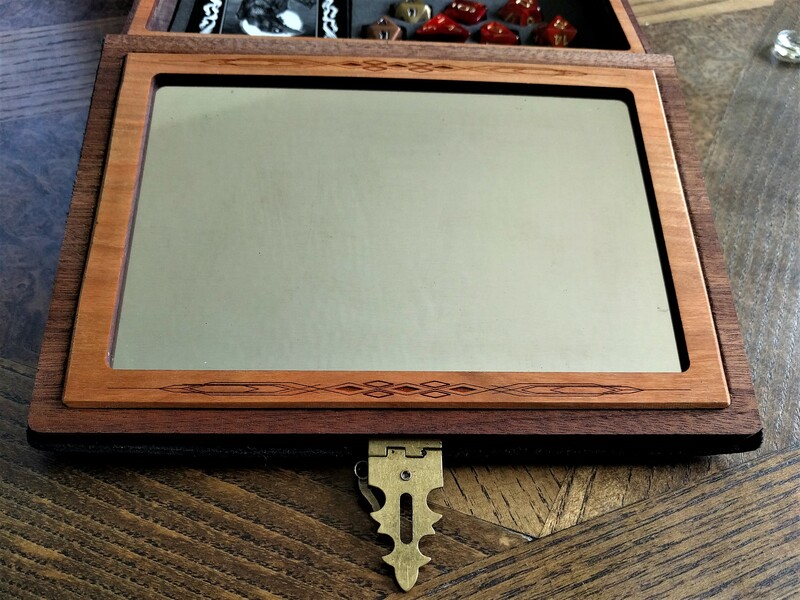 Lets crack this gorgeous thing open and take a look. The shipping box was quite basic, but firmly packed with crushed brown paper, but I love the plush velvet bag the spellbook arrives in! It’s a great addition to keep a sizable purchase safe. The material is high quality and thick stuff (I took it to an upholsterer friend of mine for his opinion). the machine stitching is quite good as well, the corner seams are sturdy as hell. I felt it needed to be stated before hand – this bag is a huge bonus. So, buckle up. I’ve decided to tear apart each option available to you when selecting the features to your own spellbook, and highlighting those features in this exact version. Hopefully, you guys will be better equipped when you are ready to make your purchase! 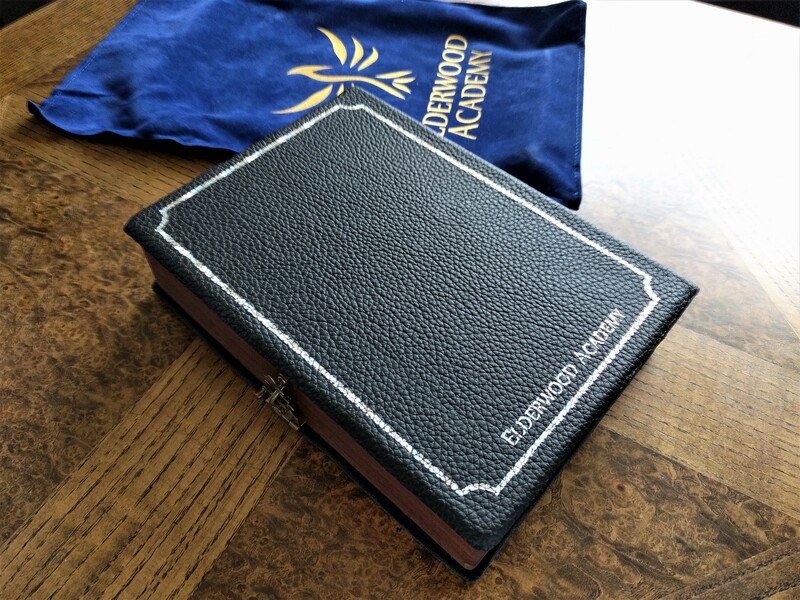 Each spellbook is wrapped in your choice of leather. Today we’re working with Onyx Leather – a deep black with only tiny hints of grey or brown in the recesses. Luckily, these options are real leather, and not a “faux leather” composite. Looks gorgeous. If you are concerned about caring for your leather – I highly suggest Bickmore Conditioner – this stuff is like magic. The foil option we have is “holographic” – giving it a wonderful rainbow gleam. So I did a huge no-no and actually tested how difficult the foil was to peel off of the leather. Thankfully, pretty damn difficult was the answer. Unless you apply excessive mechanical force (a screwdriver), a ton of friction (note: use the bag it comes with during transport! ), or a harsh chemical like acetone or rubbing alcohol – you really have few worries as far as the foil goes! The entire foil job looks even and straight, bonded well with the leather. There are even options to add foil to the spine of the book – and I highly suggest you get it. So much so, in fact, that I’ve thought about trying my hand at applying some myself – but that’d be one risky venture. Every book is made of a giant slab of your chosen wood. 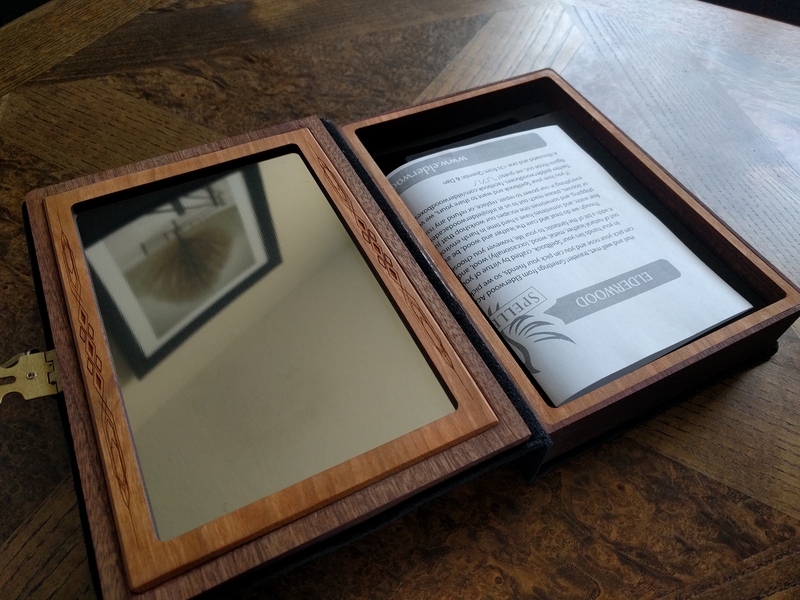 This spellbook is Walunt – a dark, nearly chocolate, colored wood with even darker black wood grain. The wood is best seen from the sides of the book. While you’re here – the locking mechanism is fantastic. Without having a traditional lock, it’s the best option I can think of other than a leather strap and buckle. 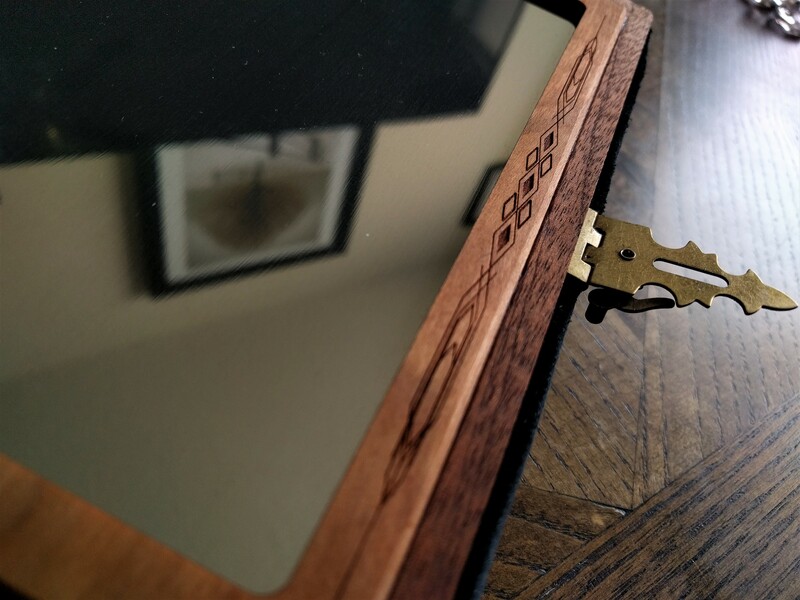 On the inside of the book, we see where the rest of the wood selection comes into play. 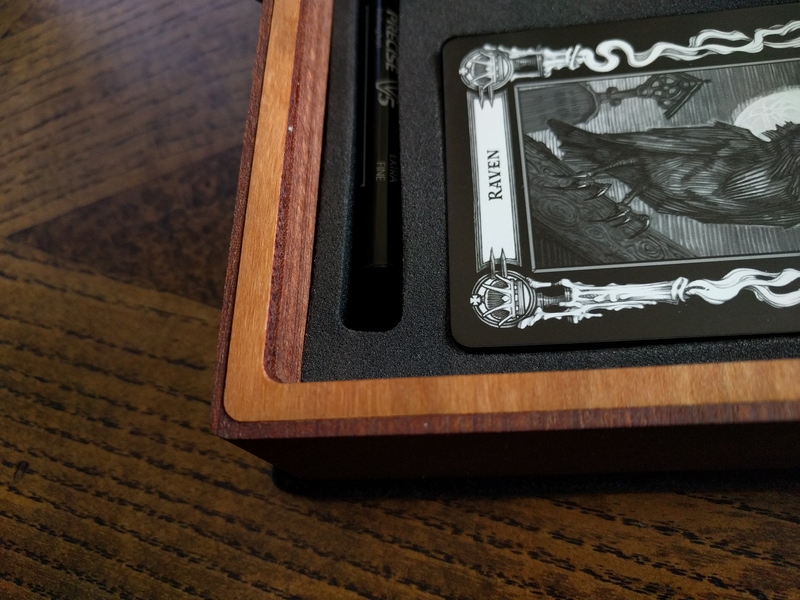 The “trim” selection wraps around both the reflective pool and the top of the spellbook proper. I’d highly suggest the Cherry option – what you see here. 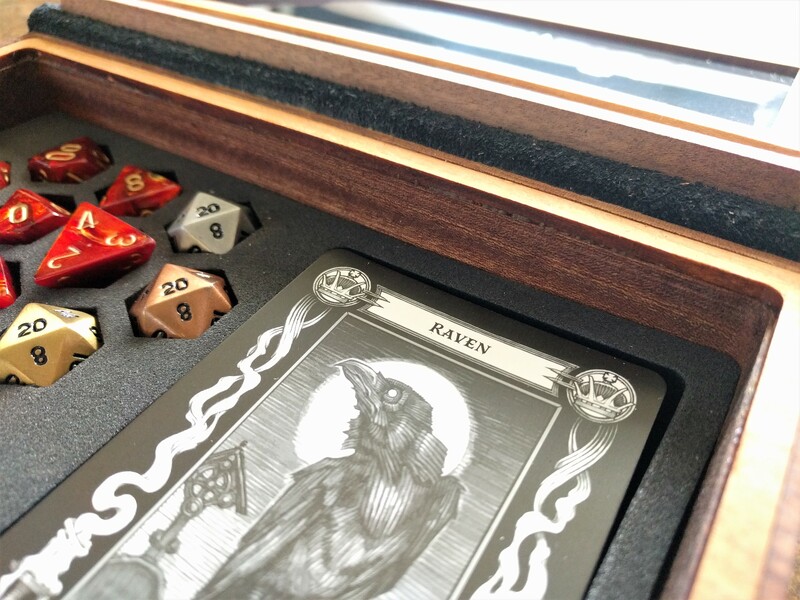 Another safe choice is the same wood you selected for the body of your spellbook, but contrast is very important. 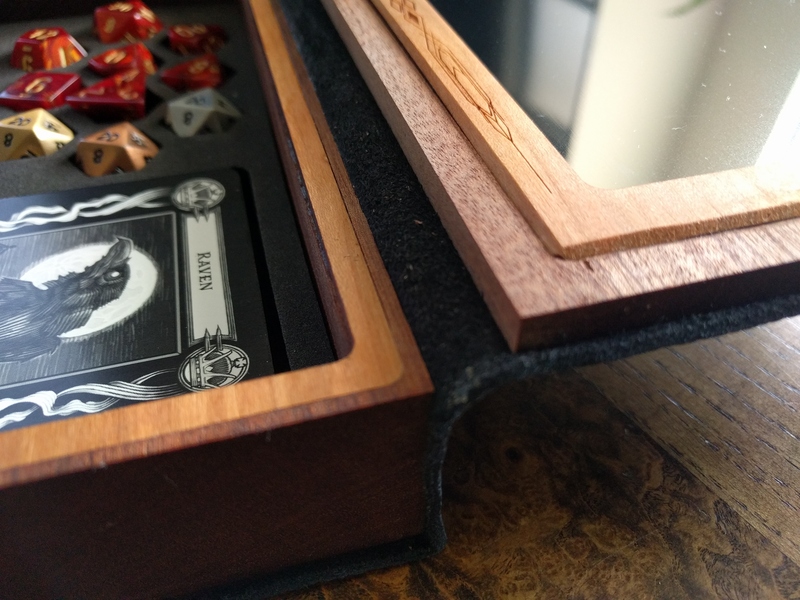 These combinations of woods I can practically guarantee will play well with one another based on the hue of the woods and the shade of the grain. Purpleheart is not for everyone – proceed with caution if giving as a gift. Each book comes with a metal surface roll on/write on/use as you see fit. The book rests at such a height that the pool angles very well for writing and reading, despite the mirror finish. I highly suggest using lens cleaning cloths to get all the smears off between uses. Lens cleaners -should- clear it all away in one pass. Our reflection pool is Stainless – a cool and clean option that I think will fit any book or color combination. Aluminum offers a brighter, bluer look, brass and copper give a more red hue – each are viable options depending on color combinations. 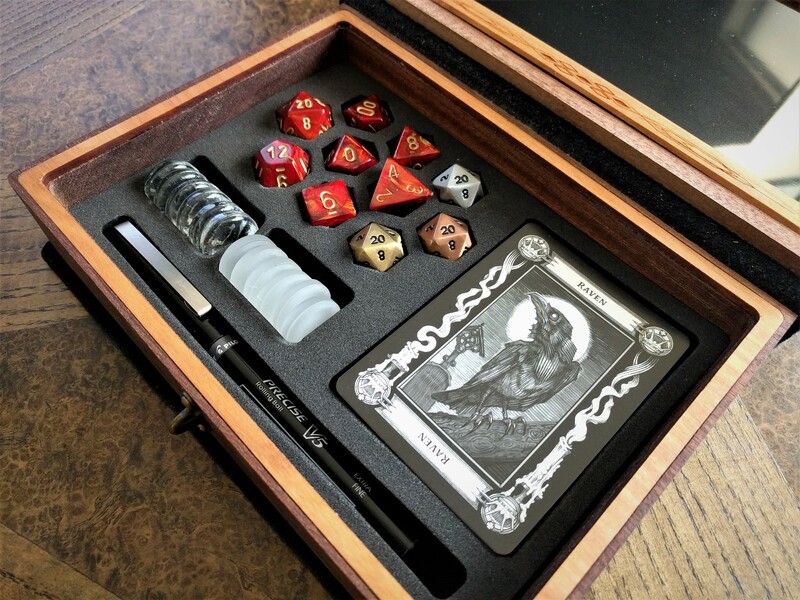 The wide-open rolling tray surface has far more utility, but those of you who swear by card games: the deck style interior should be more than adequate for you. Though this section is only a single line: it is a pretty important choice for you to make. As soon as an item is removed, you’re going to be seeing that felt lining. The great part – you can surprise yourself with a bright vivid color here – such a purple or green – to illicit that feeling of magic – or select a neutral color like black, brown, or even burgundy if you’re unsure. Here, we’re rocking a traditional black felt. The lining is, of course, expertly put in, adhered to the wood all the way to the corners and cut perfectly. A+ job, Elderwood; it’s too easy to overlook the lining. This is the most important aspect of your spellbook. Sounds dumb, huh? A foam insert is the most important part of a $100+ item? You’re damn right it is. Strikes one hell of a figure, no? Absolutely gorgeous! Allow me to also be the first to say: This foam insert is absolutely not for me. I opened the box, the bag, ran my fingers along the smooth supple leather and could not wait to fill this thing! Then I realized: I don’t use miniatures – we use pathfinder pawns. But I did have some tokens that fit well enough. 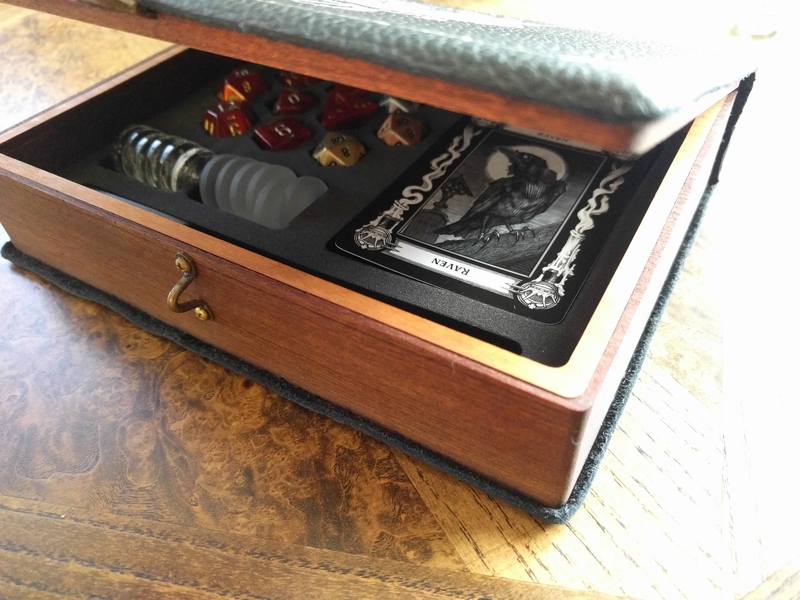 I also don’t use spell cards – but at least I have the tarroka deck for Curse of Strahd!… but they were in card sleeves, so I had to take them out to put them in the box. 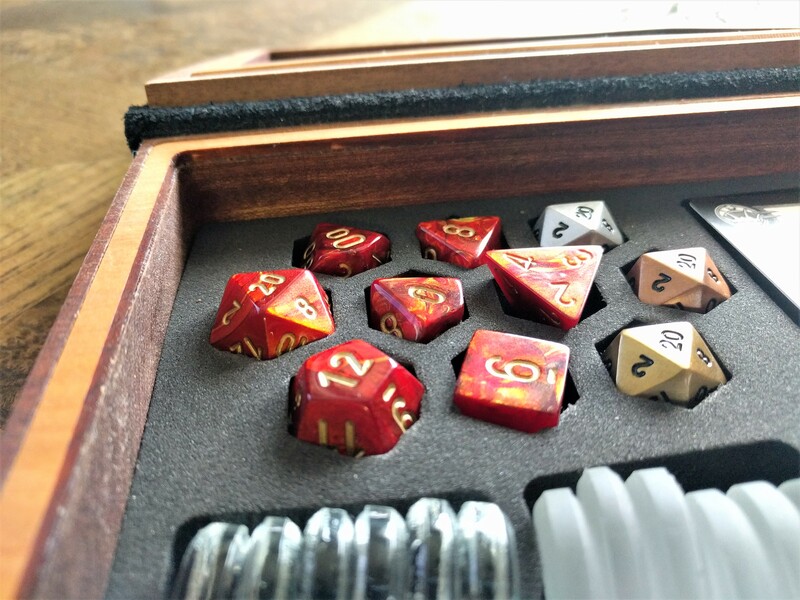 At least I have enough room for my dice – but I didn’t have three extra d6 Scarlet Scarab Chessex dice – so I ended up with three empty spots. I was a little bummed out, to be honest. And all because of a foam insert. 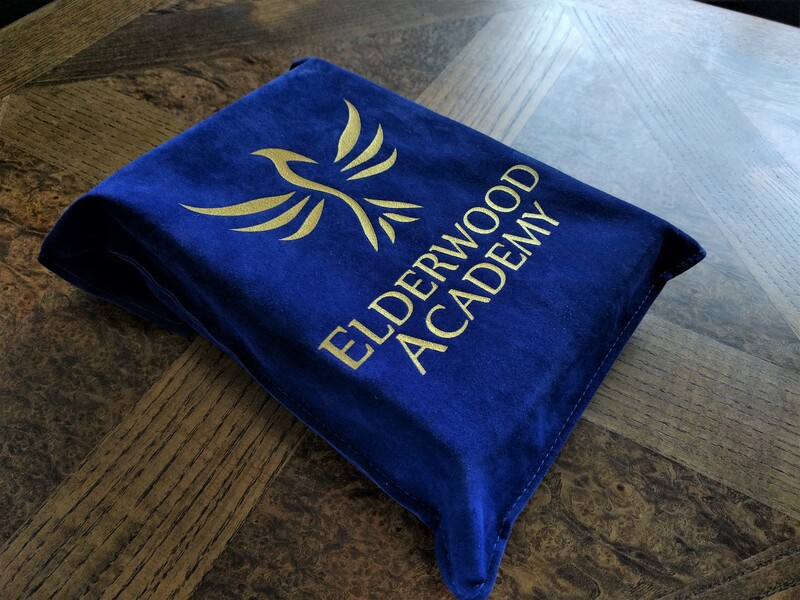 The good news: You can pick them up from Elderwood Academy for pretty cheap. Sadly, it’s not offered on their website, but you can shoot an e-mail to them and ask for others/additional inserts. Are you afraid of the depths in which the Great Cthulhu slumbers? What? Where am I? 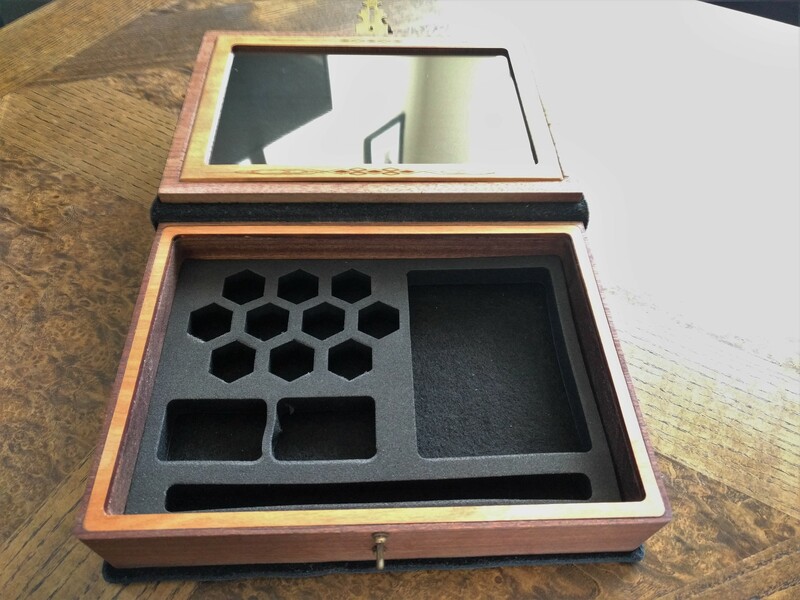 So, you have two options – just enough room to close properly (Standard) or a little wiggle room for bigger miniatures or other little surprises (Extended). 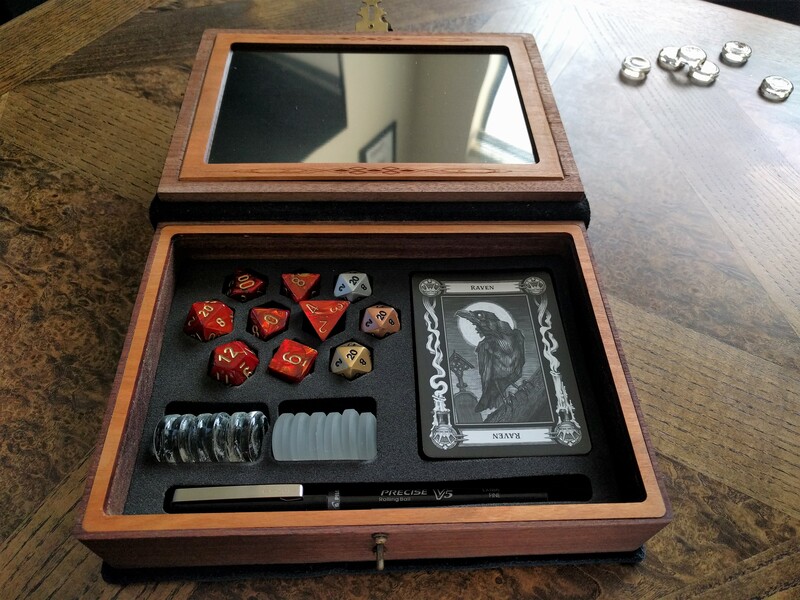 If you or the person you’re buying for EVER want to use this box for carrying miniatures – buy the extended spellbook. The extra room will prevent weapons from being bent and metal from being scraped. It’s just worth the investment! The extended book is what you see here – quite a lot wiggle room – you’ll be satisfied. If you’re unsure, you may want to get the extra 0.25″ of space to be safe. Can’t hurt a thing. Much to my surprised, the book didn’t open easily when I unhooked the latch. I thought it might have been glued or stuck – but there are actually magnets inside the lid/base – just under the trim! 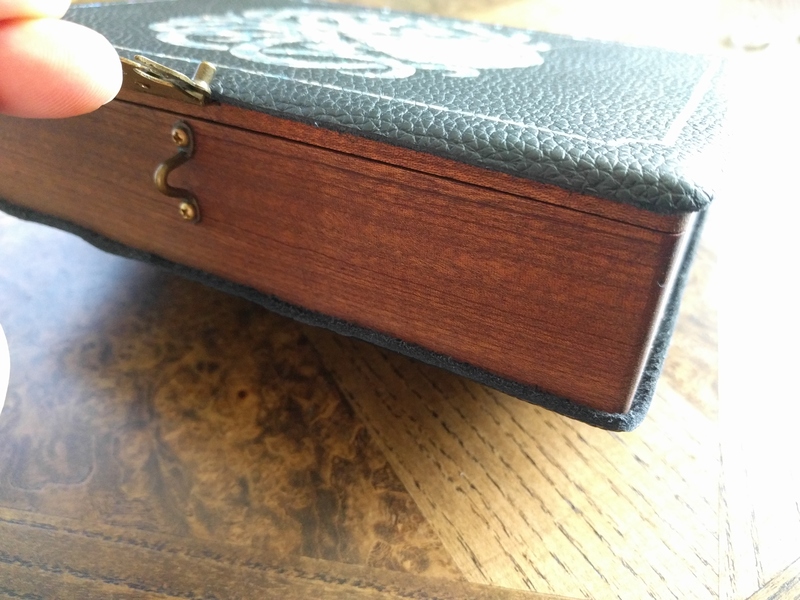 You can see, the book actually stays closed even when it’s full and the latch is the only thing supporting its weight; a fantastic addition to prevent those accidental spills. Little additions like that make all the difference in my opinion. But sometimes it’s a subtraction that speaks. 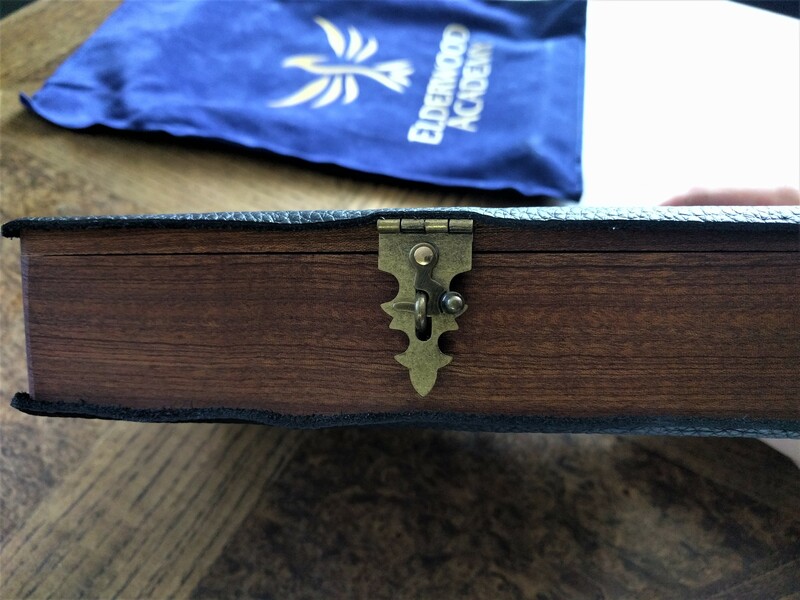 Tell me… have you seen a hinge on this book? By using the magnets to snap the lid down firmly and the latch in the front as an emergency security feature. The most common problem most boxes have is the fastenings – the hinges and screws that connect the lid to the body of the box. By forgoing that entirety, they prevent a lot of the mechanical wear and tear most boxes experience. You can see the thickness of the leather – it should have a decade of heavy use with no problems. Very good idea. This thing is an experience! From opening the bag to putting the dice back in after a session of D&D, it’s an actual experience. If you forgo the foil, and extra features – you’ll run about $105 for this book. It is a sizeable investment, I told you – I’m frugal. But think about the amount of time you’ll actually be using this, if you believe you’ll love this thing as much as I do – save up some and get one! Especially when Elderwood Academy runs some of their promo codes or special deals. That looks like a great product. Being and avid miniature enthusiast I may need to check out if they have some inserts that can hold more minis. Overall the quality convinces me and it looks very cool. It’s great! I love it, sincerely. 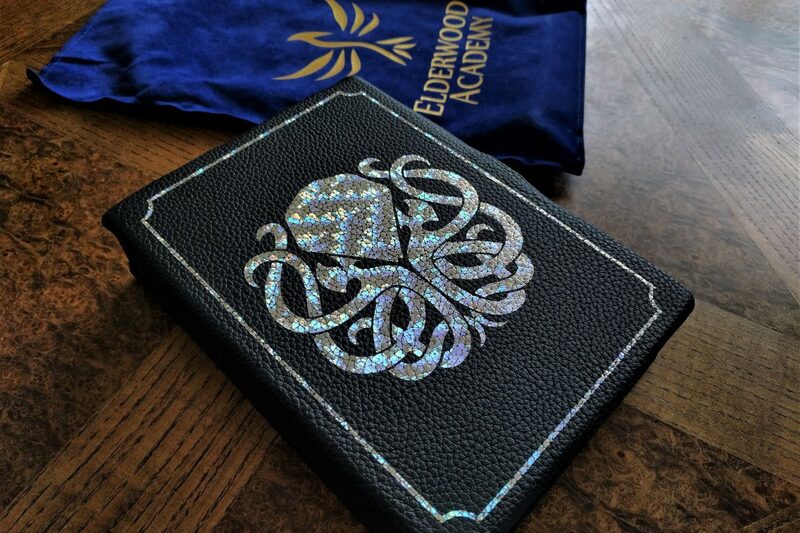 I was curious if this spellbook would be right for me so I’ve been scouring the internet for reviews. Thank you so much for going into the detail you did!! Its really helped with my decision making! I hope you got one. I love mine!